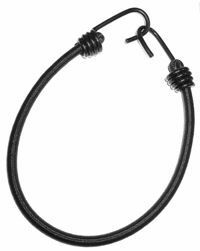 10mm black polyethylene bungee cord strap complete with a plastic coated metal hook on each end. 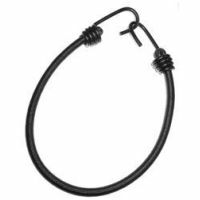 Suitable for securing luggage & keeping things in place on the move on bicycle's, motor cycles, car roof racks, vans & caravans. Size of the bungee strap is 10mm diameter x 60cm Long. This bungee cord strap has a high breaking strain, excellent resistance to ultra-violet radiation, good abrasion resistance, is colour fast & won't decay. Length is from end of hook to end of hook. The straps are adjustable by moving the hooks up and down the bungee cord.